Sounds like you already know what you did wrong. Greed set in and you wanted more. Yea just by looking back again and again trying to figure this out and yes you're right good sir I got very greedy..
A bit harder with the smaller possitions but nothing wrong with selling a quater or half the position on a nice move up and moving the mental stop loss up. Great trade, but just remember to take profits and don't be greedy, singles add up. @Masterplur47 email me at ampino@asu.edu Would like to help you out where I can. Just keep grinding. Traderchecklist.com is awesome and free! DM me if you'd like. Also watch my http://howtomakemillions.com guide! @RolandWolf Lol! I do not know what "DM' means But yes I started watching that as soon as I saw your reply. I'll keep grinding good sir! @kroyrunner what&apos;s Cobra? Did you get a new broker? I'm a newbie still trying to learn how to trade. What is a next DVD lesson I have to watch and learn after "howtomakemillons"? How do you find stocks on Robbinhood? Let's say scanners? I have opened an account with that broker too but I have not a clue how to use this tool. Your help will be definitely be appreciated! And yes thanks to Tim I cut my losses quickly. 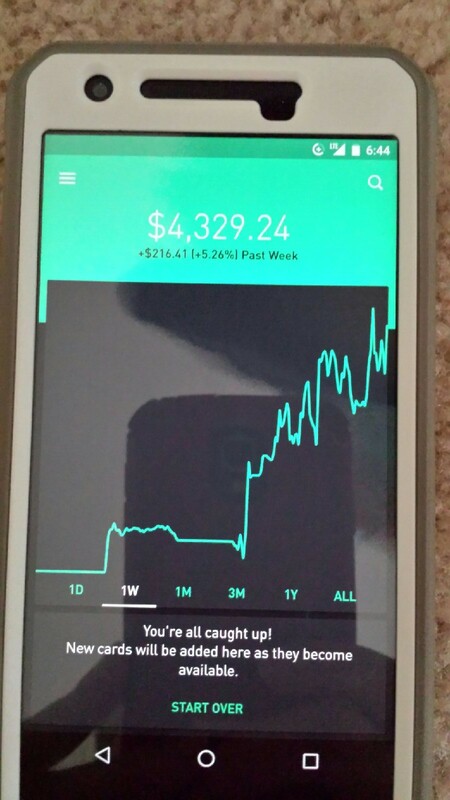 I started with $375 made 6 trades and I came out with $372.99 and took my money out before I do anything stupid. It's mainly on the timing and set ups. @Masterplur47 just became a fully transparent trader today!